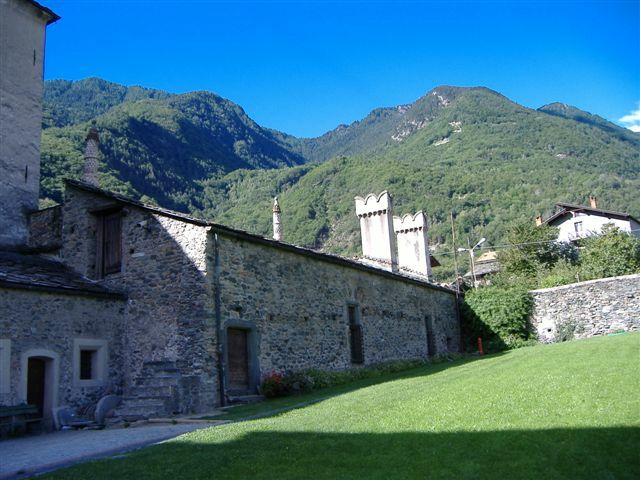 Notes: Issogne Castle is a castle in Issogne, in lower Aosta Valley, in northwestern Italy. It is one of the most famous manors of the region, and is located on the right bank of the Dora Baltea at the centre of the inhabited area of Issogne. As a seigniorial residence of the Renaissance, the Castle has quite a different look from that of the austere Verrès Castle, which is located in Verrès, on the opposite bank of the river. Issogne Castle is most noteworthy for its fountain in the form of pomegranate tree and its highly decorated portico, a rare example of medieval Alpine painting, with its frescoed cycle of scenes of daily life from the late Middle Ages.